The Mid-Weight Adjustable series has been successfully tested by an outside third party laboratory. 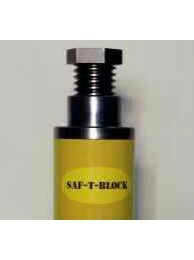 This series is specifically engineered be used between the Light Weight adjustable press block LSB rated at 35 tons, and the Standard SB-1 adjustable rated at 125 tons. This design maintains a static load of up to 75 tons. 10" Lowered Height Adjustable Length Mid-Weight Safety Block. 75 Ton Maximum Capacity..
10.25" Lowered Height Adjustable Length Mid-Weight Safety Block. 75 Ton Maximum Capac..
10.5" Lowered Height Adjustable Length Mid-Weight Safety Block. 75 Ton Maximum Capaci..
10.75" Lowered Height Adjustable Length Mid-Weight Safety Block. 75 Ton Maximum Capac..
11" Lowered Height Adjustable Length Mid-Weight Safety Block. 75 Ton Maximum Capacity..
11.25" Lowered Height Adjustable Length Mid-Weight Safety Block. 75 Ton Maximum Capac..
11.5" Lowered Height Adjustable Length Mid-Weight Safety Block. 75 Ton Maximum Capaci..
11.75" Lowered Height Adjustable Length Mid-Weight Safety Block. 75 Ton Maximum Capac..
12" Lowered Height Adjustable Length Mid-Weight Safety Block. 75 Ton Maximum Capacity..
12.25" Lowered Height Adjustable Length Mid-Weight Safety Block. 75 Ton Maximum Capac..
12.5" Lowered Height Adjustable Length Mid-Weight Safety Block. 75 Ton Maximum Capaci..
12.75" Lowered Height Adjustable Length Mid-Weight Safety Block. 75 Ton Maximum Capac..
13" Lowered Height Adjustable Length Mid-Weight Safety Block. 75 Ton Maximum Capacity..
13.25" Lowered Height Adjustable Length Mid-Weight Safety Block. 75 Ton Maximum Capac..
13.5" Lowered Height Adjustable Length Mid-Weight Safety Block. 75 Ton Maximum Capaci..
13.75" Lowered Height Adjustable Length Mid-Weight Safety Block. 75 Ton Maximum Capac..
14" Lowered Height Adjustable Length Mid-Weight Safety Block. 75 Ton Maximum Capacity. &nb..
14.75" Lowered Height Adjustable Length Mid-Weight Safety Block. 75 Ton Maximum Capac..
14.25" Lowered Height Adjustable Length Mid-Weight Safety Block. 75 Ton Maximum Capac..
14.5" Lowered Height Adjustable Length Mid-Weight Safety Block. 75 Ton Maximum Capaci..
15" Lowered Height Adjustable Length Mid-Weight Safety Block. 75 Ton Maximum Capacity. &nb..
15.75" Lowered Height Adjustable Length Mid-Weight Safety Block. 75 Ton Maximum Capac..
15.25" Lowered Height Adjustable Length Mid-Weight Safety Block. 75 Ton Maximum Capac..
15.5" Lowered Height Adjustable Length Mid-Weight Safety Block. 75 Ton Maximum Capaci..
16" Lowered Height Adjustable Length Mid-Weight Safety Block. 75 Ton Maximum Capacity. Ava..